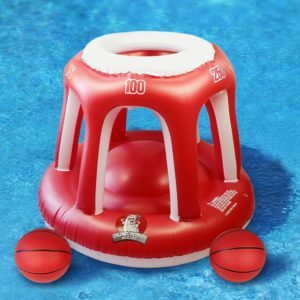 Have a look what options there are available online and how much you will have to spend for a good quality inflatable basketball game and what age they are suitable for. Colonel Pickles Novelties GIANT Pool Inflatable Basketball Toy Set In case you didn’t notice the capital letters in the headline: THIS IS BIG! Are the basketballs heavy enough for good play and not too slippery? 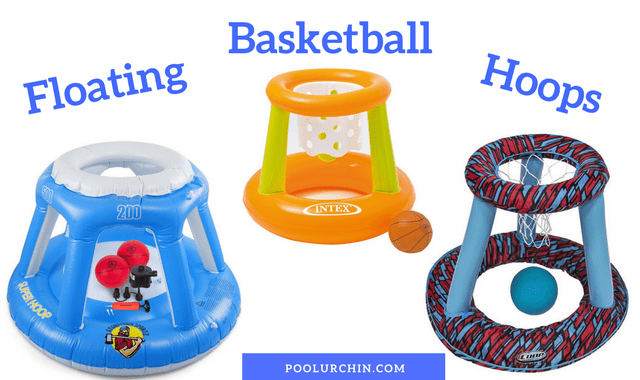 The Intex Floating Basketball Hoop in yellow and green is easy to spot in the pool. It’s a great little toy hoop! Don’t expect too much, though. It is quite light and will float and move about in the slightest breeze. It’s best for parent/child play. Ideally you will want to use your own, slightly heavier ball to play as it is more like a mini beach ball, very light and difficult to aim with. You could fill the base with water to prevent it from tipping over. 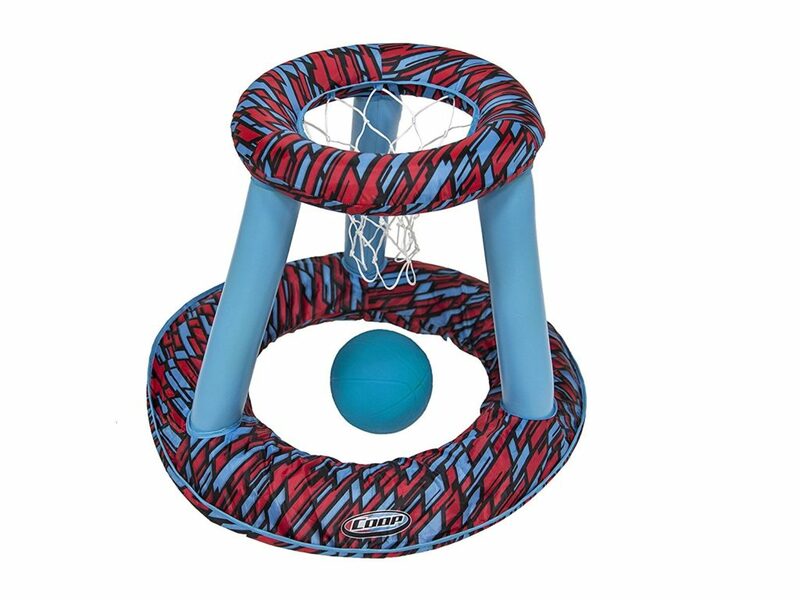 Great buy as an inflatable toy that can ALSO be used for basketball. You’ll find kids start using this first as a ball game and then invent other games: diving under it, turning it over to use as a chair, a raft…you get the picture. 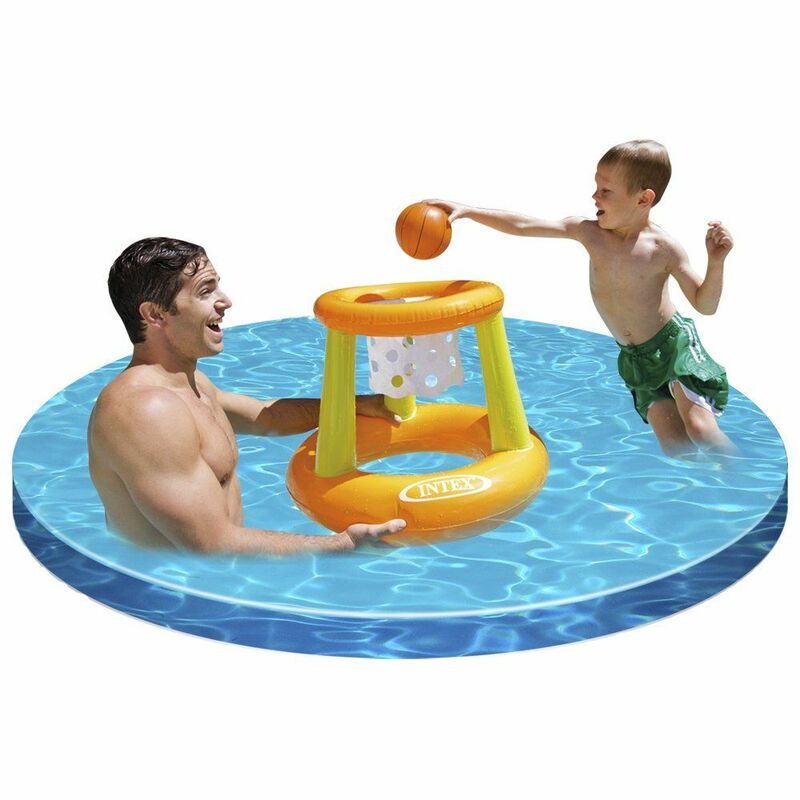 If you want something more substantial and better made than the Intex toy above have a look at the Hydro Spring Basketball by SwimWays. We like the textured feel of the fabric that covers the base. It’s well thought designed with its plastic base providing enough weight to keep it upright. It’s a cinch to set up and inflate. Inflated it stands at a height of 45-inch tall by 36-inch wide. Ideally you’ll want to get your motorized pump out so you don’t faint before the game even starts. The hoop is made of strong vinyl and should last you at least a summer. Even though it’s tall it doesn’t tip over thanks to its weight and large base. We like the score numbers on top of the side ports and big side ports themselves. Competitive older kids and adults will soon spot these and invent new games. The side ports also allow younger kids to join in and score. It comes with two grippy basketballs. Highly recommended. 7 years +. The biggest disadvantage of the inflatables is the possibility of air leaks. So make sure you inflate as soon as possible after purchase to check for any manufacturing errors and to be able to send your purchase back to get your money back if need be. On the other hand, as long as they don’t leak they’ll be used over and over again. Kids will quickly find other uses for them.